1. Grind together the coconut, clove and green chillies to a fine paste. 2. Heat little oil in a pan. 3. Saute the potatoes and carrot for a minute or two. 4. Pour enough water and cook till 3/4th done. 5. Add salt, ground paste, milk and curd. 7. Switch off flame and remove. 8. Serve hot with roti or puri. 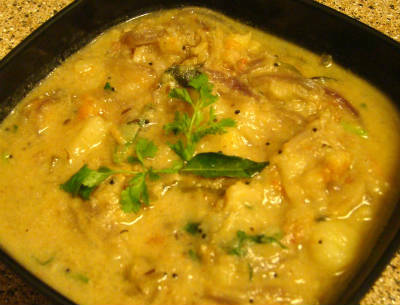 Feel free to comment or share your thoughts on this Potato Curd Kurma Recipe from Awesome Cuisine.